Check the engine oil pressure periodically. This will give a good indication of the condition of the moving parts. before checking the oil pressure, check the following. Start the engine and check if the oil pressure indicator light is turned on. If the light stays on, check the oil pressure indicator light circuit. If the circuit is ok, check the oil pressure in the following manner. Remove the left side cowling. Refer to “exterior parts removal and installation” in section 9d . 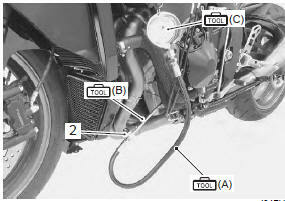 Remove the oil pressure switch lead wire (1) and oil pressure switch (2). Install the special tools to the mounting hole of the oil pressure switch. 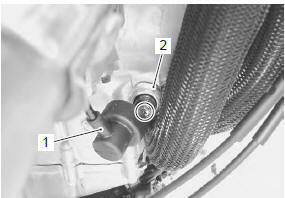 Install the oil pressure switch (2) to the adapter. after warming up, increase the engine speed to 3 000 r/min (observe the tachometer), and read the oil pressure gauge. If the oil pressure is lower or higher than the specification, the following causes may be considered. Stop the engine and remove the oil pressure gauge and attachment. Reinstall the oil pressure switch. Refer to “oil pressure switch removal and installation” . Check the engine oil level. Refer to “engine oil and filter replacement” in section 0b . Install the left side cowling. Refer to “exterior parts removal and installation” in section 9d (page 9d- 6).